The second of a two-parter begun in A Good Man Goes to War stands on its own feet like The Sound of Drums did after Utopia: the same players follow the plot thrust developing out of the first episode, but with everyone whisked off to a different time and setting where the drama can play out in an unexpected way. And given the disappointing non-drama of Demon's Run, I had high hopes that things would come together at Nazi Germany. But in spite of a few entertaining moments, the problems with Let's Kill Hitler copy those of A Good Man Goes to War almost to a tee, and can be enumerated again in a list of three. First is the appalling "payoff" of River Song, which simply isn't. She should be evolving in an increasingly evil direction, as her timeline opposes the Doctor's, with our Time Lord hero forced to watch the heartbreaking spectacle of his love turning more and more into someone who despises him. Instead, she goes from completely hating and trying to kill him one moment (with a remarkably ineffective poison) to loving him and saving him in the blink of an eye -- and which she does by of all things relinquishing her future lives, funneling them into a regeneration that he can use. Not only is it not clear why he can't regenerate himself (other than requiring Matt Smith to leave the show), it's incredible that River Song would sacrifice herself this way for a man she is now coming to grips with at this point in her timeline. I'm starting to believe that Moffat never really had a plan with River Song. Everything anticipated with her character since the fourth season just happens here for no reason: she inexplicably decides that she loves this man, and in a matter of moments comes the blue diary, learning to fly the TARDIS, and (presumably) the Doctor telling her his real name (!). There's no story here, and we're light years away from the brilliance and tragedy that ended Silence of the Library/Forest of the Dead and promised more of the same. Second is the way Matt Smith is starting to suffer under Moffat's penmanship. In the producer's scripts, the Doctor is becoming little more than a motor-mouthing quip machine. There were shades of this in The Pandorica Opens/The Big Bang and The Impossible Astronaut/Day of the Moon, but now it's getting thoroughly out of hand. Moffat has either exhausted his genius or just desperately needs us to know how clever he is, to the point where hyperactive dialogue and unwieldy plot twists obliterate character development and internal logic. But last is the title's non-sequitur: the Hitler plot isn't, and the grand opportunity to use him in the way Nixon was in the season opener goes entirely to waste in favor of the insanity described above. 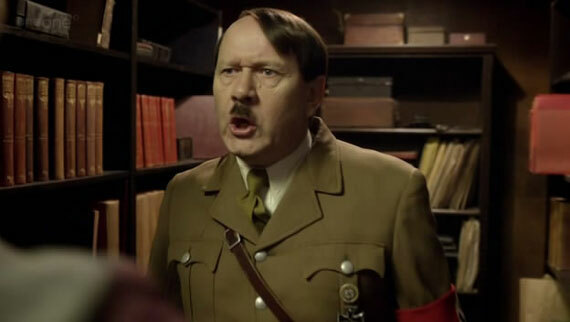 Let's Kill Hitler is more Let's Lock Up Hitler in the Cupboard and Forget About Him, which is exactly what happens after the TARDIS crew drops in and unwittingly saves his life (a nice touch, admittedly). In this sense, the episode thoroughly repeats the crimes of A Good Man Goes to War, which was a not-war, rather a stage for a gratuitously zany Doctor. 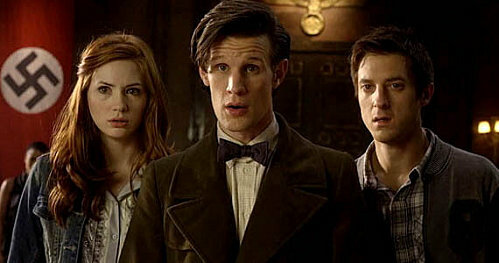 Here, likewise, the Third Reich drama is mere window dressing, leaving woefully underdeveloped the Tesalacta -- a cadre of humanoids who travel through time punishing the worst villains who escaped justice -- while Amy, Rory, and River all command center attention in their awkward and unconvincing family comedy. Excellent review, Loren, even though I don't entirely agree with you. My problem is that I just adored the "Whogasm" moment of the regeneration of Mels into River Song. Moments like that just make new Who for me, the ultimate example -- of course -- being "I am the Master" in Utopia. But I hate to say that I have a horrible feeling that you might be right about this, especially the worry that Moffat is, after all, making it up as he goes along.